We all know that the fashion industry comes up with major new trends every season that are being hyped beyond all measure. However the same happens in the beauty industry. Be it the Babyliss hair curlers, the ghd straighteners, the Beauty Blender, the Invisibobble or currently the Kylie Lip Kits - Every beauty addict had to have these products in her bathroom. One of these hyped beauty products was and is the Tangle Teezer. 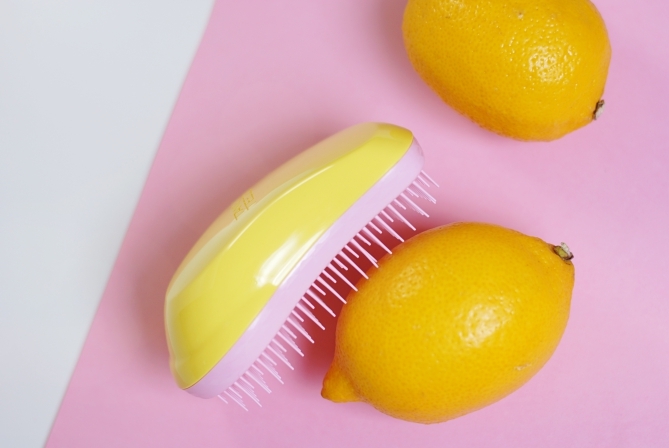 For those who've been living under a rock these past years: The Tangle Teezer is a brush that promises easy and painless detangling of wet and dry hair. The brush has been developed by a hairdresser and is said to be the first professional hair detangling tool. Meanwhile it is being used by individuals and professionals alike. 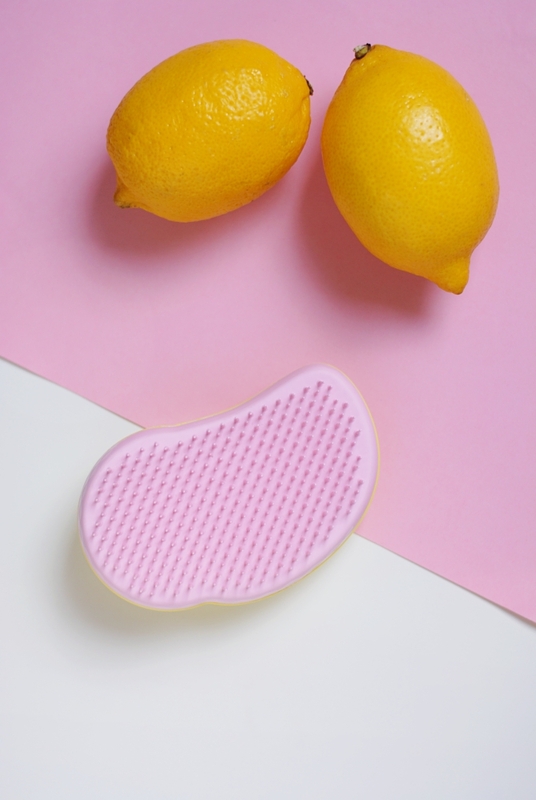 Besides from the Original Tangle Teezer the brand offers a compact version, a children's brush, a Tangle Teezer for thick and curly hair, a special wet brush, as well as a blow-styling brush. 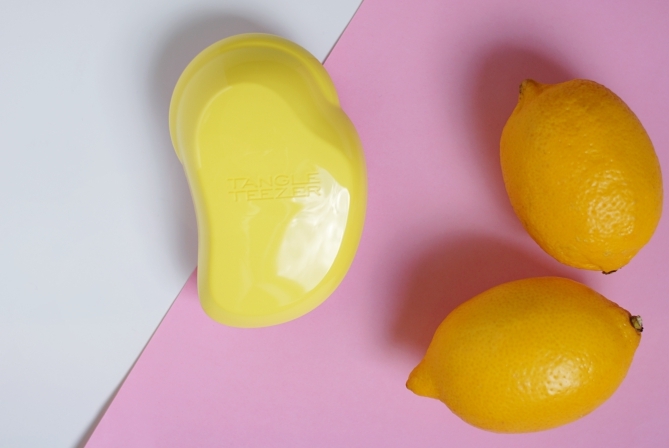 For my review I chose the original Tangle Teezer in the limited edition colour lemon sherbet. The brush is light but of a rather good quality. It lies well in the palm of the hand and doesn't slip away while using it. The thin bristles, which are made of soft plastic, have two different lengths. They do not have rounded knobs but are rather pointed, which I found a bit painful at first. That's why I think Tangle Teezers might not be suited for people with a sensitive scalp. The detangling effect most probably results from the different bristle lengths. They cause that the different hair layers get brushed one by one, so if you have thick hair you will have to comb through it more often than with a regular brush, until all layers have been detangled. However this also means that detangling will indeed be less painful. However I must say that I did not lose any less hair when using the Tangle Teezer compared to my regular brush. The brush will thus not protect you from natural hair loss, but at most from breaking hair (which is pretty hard to prove though). All in all I believe that this brush can be really good at detangling hair, but unfortunately I couldn't try this effect on me as my hair is super easy to comb. I would recommend it to everyone with children or problematic hair though, but I don't think anyone with regular hair needs to switch to a Tangle Teezer just because it has been hyped so much.